ALL orders place from December 31, 2015 thru February 10, 2016 will be shipped on Thursday February 11, 2016. We are happy to provide online shipping. Our method of shipping is through USPS Priority Mail. Express mail can be used and is offered at an additional charge. 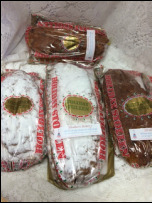 Please keep in mind we ship our products fresh and make sure we bake it for your order. In that regard we can not offer same day shipping. We ship Tuesday - Saturday. If you place your order before noon and payment has been cleared we will be shipping the next day. Any orders placed after noontime will be shipped in two days. Of course you may leave in the special instruction section a future date you would like the crumb cakes shipped if immediate shipping is not your preference. 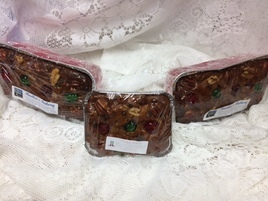 If you would like to include a note please do so in the gift option section. 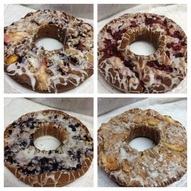 Each cake serves approximately 6- 8 servings. Our world famous crumb cake topped with fondant drizzle. Why wait until St. Patrick's Day? 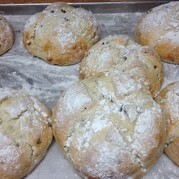 One of the best tasting Irish Soda breads you will ever have. Available all year. Each bread serves approximately four generous servings. Delicious, moist, dense (like pound cake) yellow cake. Topped with your choice of apples, blueberries, cherries or harvest then covered with our famous streusel drizzled with fondant icing. Each pudding cake serves approximately 7 - 9 people. Offered in both long and short sleeves with color choices of white, neon orange and neon green. 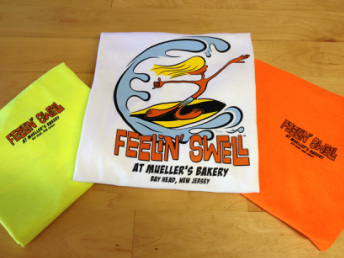 Front: FEELIN' SWELL at Mueller's Bakery, Bay Head, New Jersey on the left chest area. Back: FEELIN' SWELL surfer dude logo with at Mueller's Bakery, Bay Head, New Jersey. Proceeds from the sale of these shirts will go to local charities assisting those effected by Superstorm Sandy. Offered in indigo blue color in both long and short sleeves. 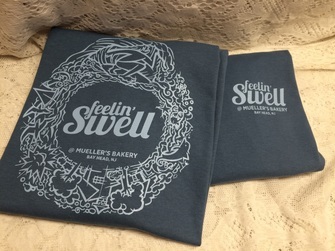 Back: FEELIN' SWELL design logo with at Mueller's Bakery, Bay Head, New Jersey. A design that incorporates what our life here at the Jersey Shore is all about. Of course we are always happy to take your order over the phone.